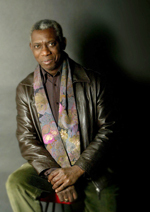 Bogalusa native and Pulitzer Prize-winning poet Yusef Komunyakaa (koh-muhn-YAH-kuh) recieved the 2007 Louisina Writer Award. Komunyakaa was born in Bogalusa, La., on April 29,1947. His poetic interests are founded upon and driven by a wide range of influences that include the poetry of the Bible, the cultures of Africa as captured in blues, jazz and gospel music, the poetry of Langston Hughes and Gwendolyn Brooks and the Western canon in general. Of particular consequence are his childhood experiences of Bogalusa and later, the Vietnam War; during the war, he reported events from the front lines and edited a military newspaper as an “information specialist” in the army. Komunyakaa credits reading James Baldwin’s Nobody Knows My Name as the catalyst for inspiring him to write; he began writing poetry while still in high school. His principal books of poems include Gilgamesh: A Verse Play (with Chad Gracia, 2006); Thieves of Paradise (1998), which was a finalist for the National Book Critics Circle Award; Neon Vernacular: New & Selected Poems 1977-1989 (1994), which received the Pulitzer Prize and the Kingsley-Tufts Poetry Award; Dien Cai Dau (1988), which won The Dark Room Poetry Prize; and I Apologize for the Eyes in My Head (1986), winner of the San Francisco Poetry Center Award. His honors include the William Faulkner Prize from the Université de Rennes; the Thomas Forcade Award; the Hanes Poetry Prize; fellowships from the Fine Arts Work Center in Provincetown, the Louisiana Arts Council, and the National Endowment for the Arts; the Pulitzer Prize for Poetry; and the Bronze Star for his service in Vietnam. In 1999 he was elected a Chancellor of The Academy of American Poets. Currently, he is Professor & Distinguished Senior Poet in New York University’s Graduate Creative Writing Program.